We headed to Calgary to check out all things kids in Calgary and found a fun city with lots to do in and around it. As Starwood Preferred Guests Members and major point collectors, we decided to check out the Westin Calgary Hotel Calgary. It was the perfect launching point for some really cool adventures. Our starting point each morning was the Starbucks located in the lobby of the Westin Calgary. After fuelling up for the day, we found a variety of fun things to do right around the hotel. 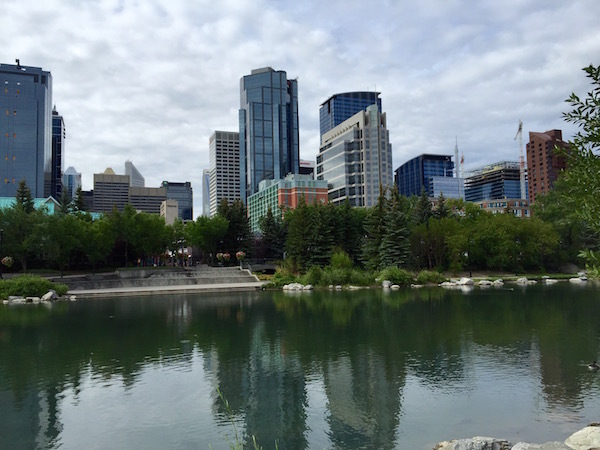 The hotel is located steps from Prince’s Island Park and Eau Claire Plaza which has a great wading pool, full park and retro ice cream truck with fresh made goods to offer. Both parks are free and offer a lot for kids to do and see. If you need a break from the sun or the weather turns, check out Devonian Gardens just a few blocks from the hotel. The gardens contain a variety of trees and fish and a large indoor park that is a lot of fun. In the early afternoons, we would retreat back to the Westin Calgary which had its own indoor pool. Seeing it hailed twice while we visited in July, I quickly understood the choice many Calgary hotels made to build indoor pools. The pool is heated and open 24 hours a day. 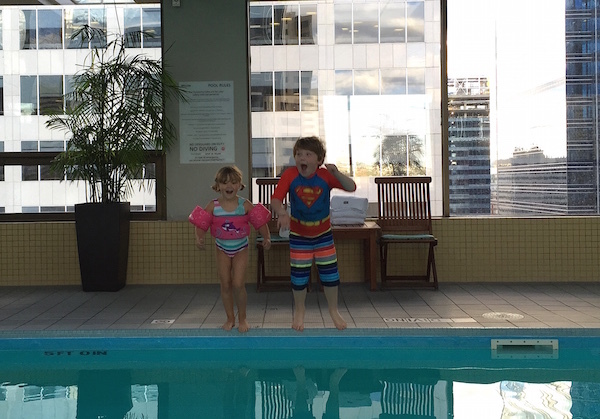 We took advantage of the hours and often had a late night swim right before bed making bedtime a lot easier for me. The hotel itself is very kid friendly. We stayed in an Executive Junior Suite which gave us plenty of room to spread out over the week. When relaxing, I could chill or work in bed or at a desk while the kids had an entire sitting area to hang out in. The layout of the room was such that I could watch them but still have my own space. We ended up hanging out in the room more than expected because we loved it so much. Like many Westin hotels, a big part of staying at the Westin for me is the Eat Well Menu. This summer we have spent about 6 weeks on the road and that much travel takes a toll on everyone’s eating choices. The Westin starts its in-room dining menu with the healthy options first. I love that I don’t even see the other options and always choose something from the Eat Well Menu. The best part is the Kid’s Menu. 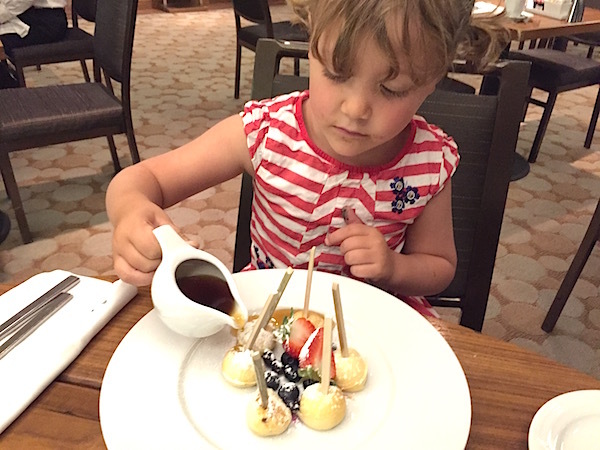 The Westin Kid’s Menu is a true reflection of the Eat Well Menu and contains nothing fried but still offers a lot of fun options like banana stuffed pancake pops. I knew if we ate at the hotel, it would take away the option of a traditional kids menu at a restaurant and found we preferred to eat dinner at the hotel for that reason. If you are an SPG points collector and happen to be at the hotel on a Wednesday night there is a fun happy hour that takes place in the lounge near the lobby. Along with a good spread of healthy food and charcuterie, SPG also offers complimentary beverages a.k.a free wine. We loved meeting the other SPG members and their kids and had a lot of fun that night. 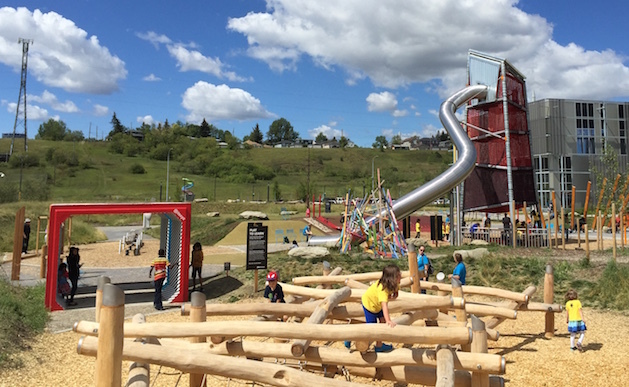 When visiting, you will find Calgary and the surrounding areas offer a lot of fun options for kids. Here are my favourites. There is no better activity for kids aged 5-12 than the Telus Spark science centre. As you can imagine, I have visited my fair share of science centres across North America and never have I been this impressed. The centre is small but packed with great activities. We planned on visiting for half a day and ended up spending almost 2 full days onsite. The science centre is so cool that they host monthly adult only nights for the adults who want to check it out. The best part of Telus Spark is located outside in what is called the Brainasium. Basically, its a giant outdoor gym that challenges your child’s body and mind. I’m not going to lie, I played on the equipment the whole time too. It was challenging, fun and the type of thinking I wish our local parks had when planning park design. Bring sunscreen as its new and not very shaded quite yet. Don’t miss out on the indoor activities which include an indoor park, tons of exhibits and some great shows. Beyond the Brainasium, we spent a lot of our time on the second level playing with stop animation, designing dresses and even building a bicycle with the staff. If you only have one day in Calgary with kids, I would recommend Telus Spark hands down. 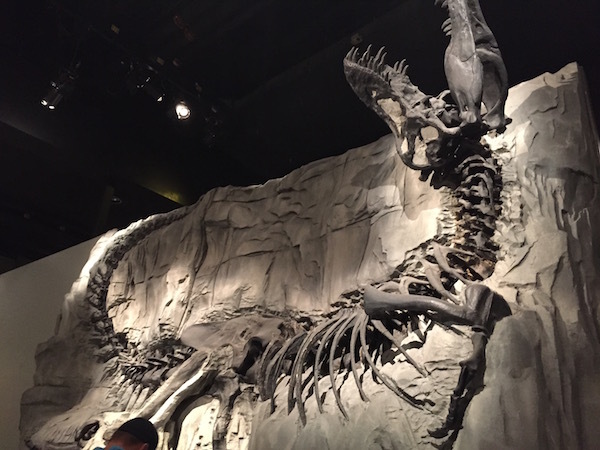 Located in Drumheller, Alberta about an hour out of town, the Royal Tyrrell Museum is an incredible museum. Unlike traditional museums which feature a few dinosaur skeletons, this place is packed full of interesting information and incredible finds. I worried my kids would get bored after seeing a few exhibits but instead they grew more and more interested in what happened in the area and how the bones were found. Unfortunately, we visited on a very rainy day and didn’t get to do much outside but there are ample activities in the area to keep your dinosaur loving kids busy for a whole day. The museum is very well priced and is great for people of any age. 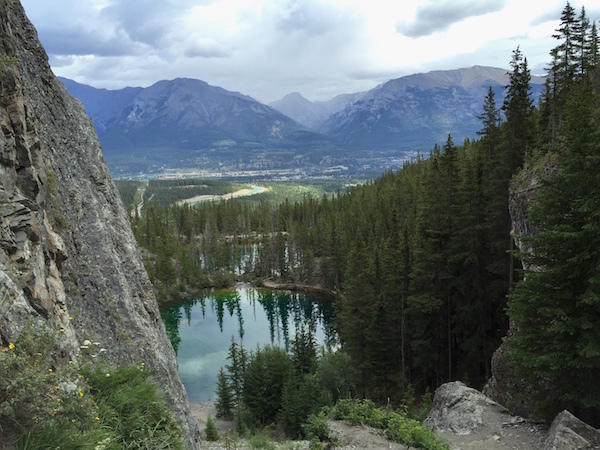 You don’t need to head into Banff National Park from Calgary to find good hiking. Instead pull of the highway in Canmore to find the trails used by locals that are much less busy than those in Banff. It is easy to hit the trails in the morning, complete a fun hike and then have a great lunch in Canmore and be back in Calgary by mid-afternoon. To be honest, we didn’t have a great day at Calgary Olympic Park. Still, I wanted to review the pros and cons in case you are considering a visit. To begin, the park itself was designed for the Calgary Olympics and is really for teenagers. I am guessing that if you have a 14 year old, the day would be awesome. 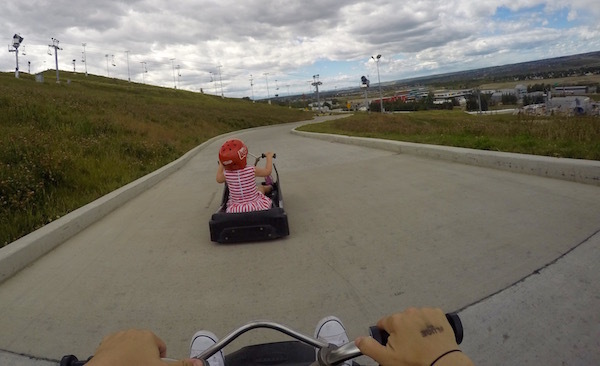 For kids of all ages, there is a great Luge trail but its expensive. When we went to purchase tickets, the woman working the desk wouldn’t answer questions about the family packages and told me all the information was available online. I literally had to stand next to the desk and read the package information on my cell phone. After that, we bought some luge tickets separately and had a great time on the run. In the summer especially during the week, the park is filled with summer camps. The camps look incredible but unless your kids are in them, there is very little they are allowed to do at Olympic Park. We saw rock climbing, great tree trekking courses, and bungee trampoline but were told all the activities were only available to camp participants during the week. We ended up heading to the mini-golf and purchasing 3 games for $20. As we went out to the course, we realized that each hole had at least 10 campers on it and they were in no way playing mini-golf as it was intended. After the first hole and a 30 minute wait in the sun, we returned our clubs and were told there were no refunds. The other activities at the park included trying the bobsled track (14 and older) and a very cool looking zip line for kids 70 lbs and up. I would only go on weekends during the summer and would arrive prepared with the package you would like to purchase. 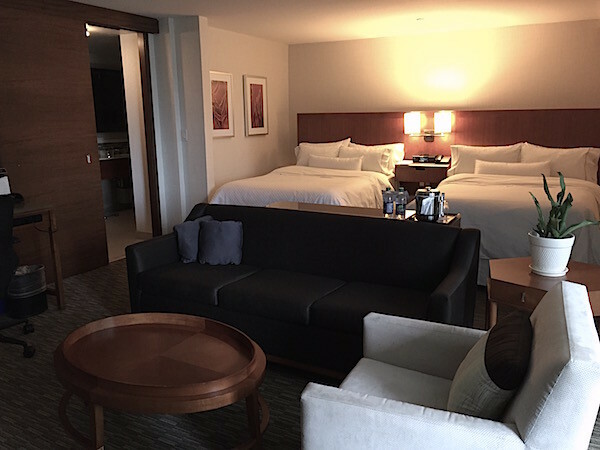 We absolutely loved our time spent in and around Calgary and I would recommend the Westin Calgary Hotel Calgary as a starting point for a great adventure in Alberta. 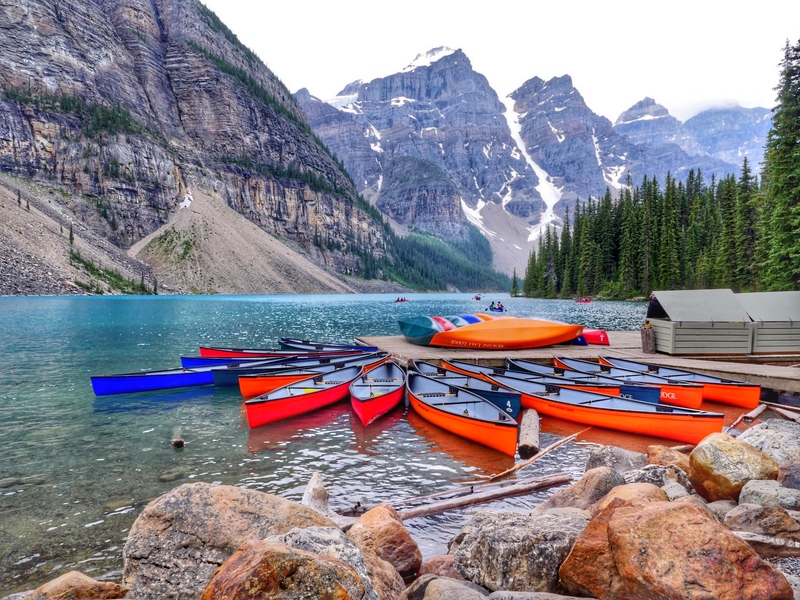 If planning an adventure to the area, you will need a rental car or will be spending quite a bit in taxi fares if you plan on leaving the downtown core. Great parks, Telus Spark and a ton of restaurants are all accessible by transit, bicycle or in our case scooters along the many bike paths that hug the gorgeous Bow River.